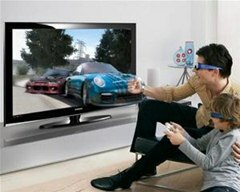 3D TV is hovering in the not too distant horizon, which most likely means costly transitions. Luckily John Sciacca offers some ideas for dirt cheap alternatives. "The answer is to get a 3D-ready DLP TV for cheap, then bank on an announced (but still to come) device that will magically make your TV compatible with the new 3D Blu-ray standard. The device is expected to cost about $100. So, for example, if you picked up the Mitsubishi WD-65737 for about $1,000 (used models sell for about that much) and the magic box, you'd be spending less than half the cost of the cheapest 3D TV that Samsung is selling right now. Sure, you won't have the sleek form factor of a flat panel, but if you're putting your set on a stand anyway, that's not a big deal." Click through for the entire low down: John Sciacca's 3D TV For Dummies: 10 questions answered about 3D TV. Previously, Nintendo to Launch 3D Handheld This Year. HowTo: Shoot Your Own 3D Movie for $250. Solidoodle: Cheap 3D Printing at Home for Under $500! HTC EVO 3D: The First Glasses-Free 3D Smartphone in the U.S.